Illinois has over 2500 miles of trails which makes snowmobiling one of the most popular winter sports here. This can be an exciting way to enjoy the cold months for those who follow the safety precautions and state regulations and drive responsibly. However, sometimes a person’s negligence or a defective vehicle can ruin the experience and can lead to accidents. Age Limit: A person under the age of 10 is not allowed to operate a snowmobile. Those who are between the ages of 10-15 years old can drive a snowmobile only if they are accompanied by a parent or guardian or a person at least 16 years of age designated by a parent or guardian. 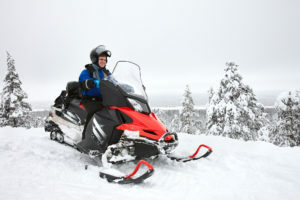 Insurance: Operators planning to snowmobile on a marked trail that is not their personal property or on someone else’s private property are required to have a liability insurance. A sport like snowmobiling comes with risks. The vehicles weigh more than 600 pounds and can surpass a speed of 90 MPH which makes them dangerous if not driven carefully. Generally, the liability of any injuries causes due to a mistake or other uncontrollable circumstances is on the driver. If a snowmobile operator gets hit by another rider due to their recklessness, they are eligible to receive compensation for the damages. If a snowmobiler driving safely and following the state regulations gets hits by automobile due to the driver’s negligence, the motorist is liable for the injuries and damages. If the accident leading to injury or wrongful death occurs due to a manufacturing defect in the snowmobile or improper maintenance on a rented vehicle, a case for liability for their damages may be considered. Every year approximately 200 people die and 14,000 get injured due to snowmobile accidents. While a lot of these accidents occur because the sport is inherently risky, some are a result of negligence. If the latter is the case, it is important to refer to an experienced personal injury lawyer. Contact Fisk & Monteleone Ltd at 815-962-0044 now to see if you are eligible to receive compensation for the damages and injuries.